A merlin, as depicted in our Merlin Open Systems logo, is a bird of prey. 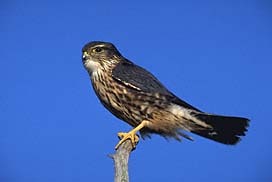 In fact, the merlin is the smallest bird of prey in the United Kingdom. It is a threatened species and is on the Amber list even though its population is recovering from a decline during the 20th century. 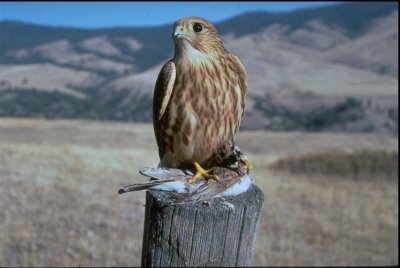 Merlin feed on a range of small birds by flying at high speed very close to the ground, and make full use of their acrobatic agility to keep to the contours of the land. They nest in open hilly, mountain or moorland regions in an old stick nest in a tree, or on a cliff face, or in deep beds of heather such as the heather moorlands of the Peak District in England.